My last post was all about hosting a New Year's Eve dinner party and how to create that dark, glitzy, nightclub feel in your own home. 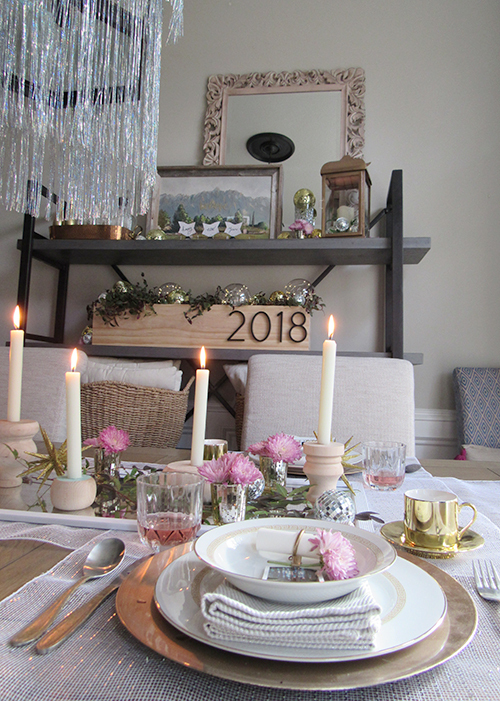 Today I want to show you how you can use a lot of those same elements to create a daytime table setting that is perfect for a New Year's Day brunch. You know those fashion posts that show you how to take a day look to night? Let's do that in reverse. If you're wondering why someone would throw a brunch instead of a NYE party, hear me out. Some people have a hard time going out on NYE. Perhaps you are like me and you have small children. Since so many people have NYE plans, it can be almost impossible to find a babysitter. You know when I always have free time, thought? New Year's DAY. Most jobs, mine included, have that as a holiday, so we are all feel to luxuriate and have brunch. If one of my friends were to host a brunch at 11 a.m. on New Year's Day (enough time for others to recover from the night before) and told me there would be munchies and mimosas, I would be there in a heartbeat! If you haven't read my last post, here's a quick glimpse at the same dining space and how I changed it from day to night while keeping a lot of the same pieces. Let's get right to it! 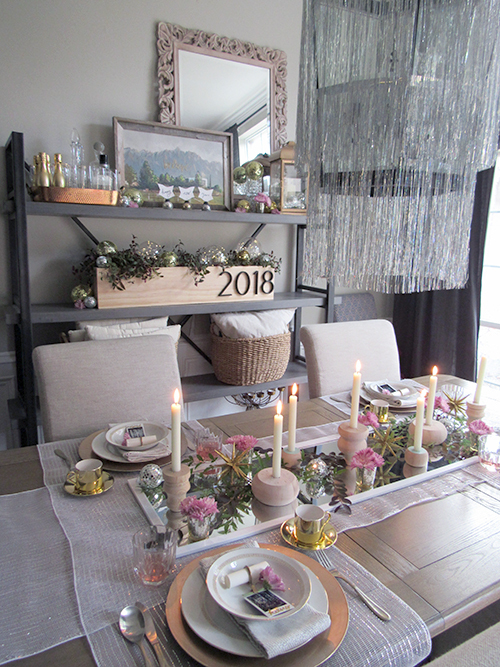 I wanted this brunch tablescape to feel fresh and hopeful, like the start of a new year should feel. I chose natural wood finishes and touches of purple (in honor of the Pantone color of the year!) 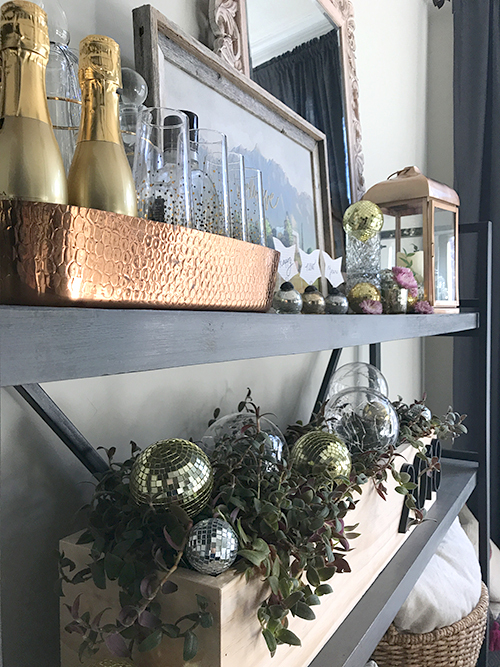 to create a pleasant atmosphere for any brunch occasion.The disco ball ornaments are important accessories here, instantly taking this from party from generic brunch to New Year's brunch. 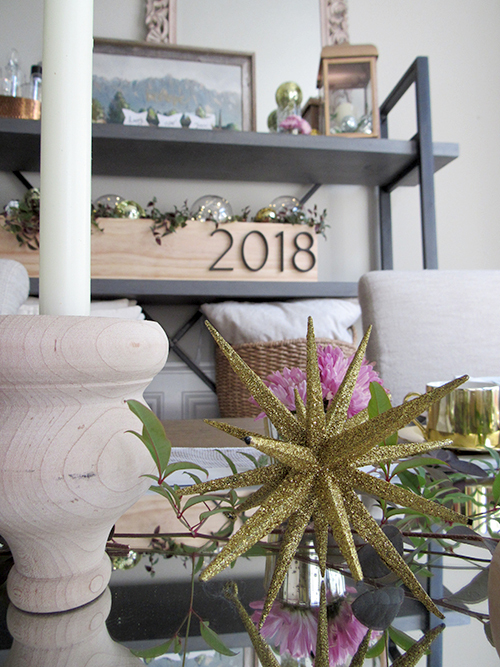 I tried to mix the natural elements of the wood and plants with the more sparkly accessories to create a soft, welcoming look. I kept the base of the table setting the same from day to night. 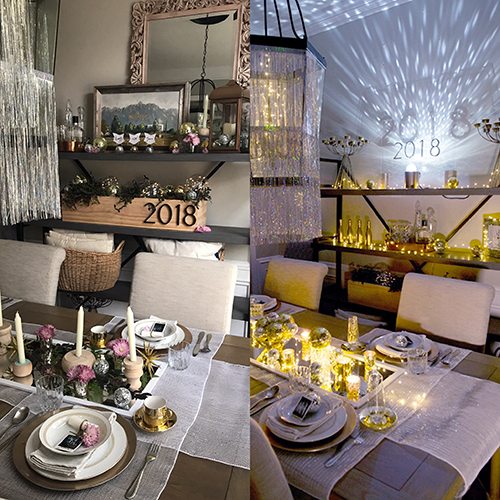 The chandelier, mesh table runner, mirror centerpiece and place settings are all the same as my NYE dinner party decor, but they have a different look with natural light. You still get a little sparkle, which is a subtle nod to festivities. I hatched the idea for those DIY candlesticks back in May when we were building our new media cabinet. Those are actually made out of furniture feet that you can find in the lumber section at your local Lowes. I used some of those low, round bun feet on our media center, and I remember thinking at the time that some of the turned feet really resembled some of the fancy, rustic candlesticks on the market. The table feet come with a screw sticking out of the top so they can be attached to furniture, so the only thing I needed to do to convert them to a candlestick was drill a tiny hole in the bottom of my taper candles with my power drill and screw the candle on to the top of the furniture feet. I love how they feel both traditional and casual. I painted the tops of the smaller ones to add a bit of color to the centerpiece. 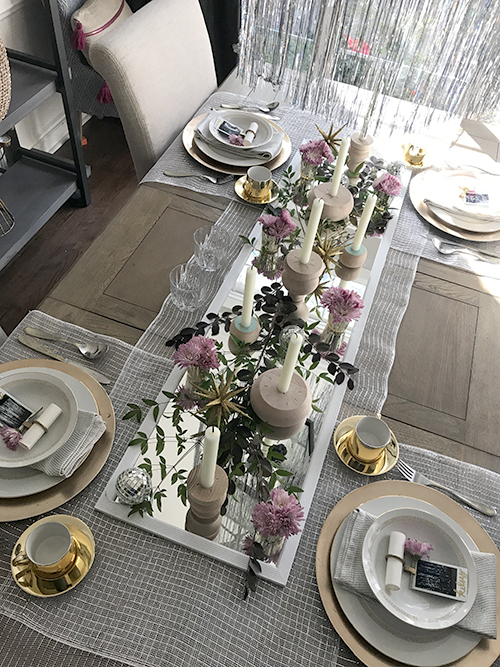 You can see how different this mirrored table runner feels when it's layered with greenery from my yard and the raw wooden finish of the candlesticks. It really warms up the slick finish of the mirror so that the table feels cozy instead of glamorous. 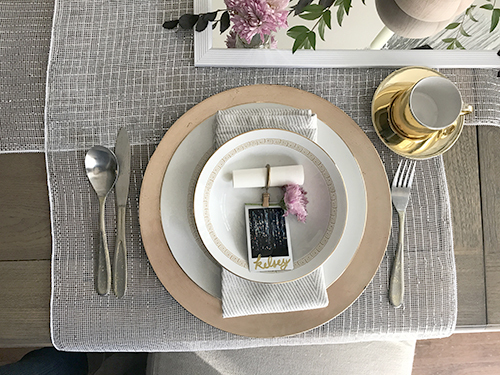 For the table settings, I used an unexpected item - a shower curtain clip that I spray-painted gold - to hold a rolled sheet of paper. The curtain clips came with the little clamps, wihch I used to hold a flower and an abstract Instax photo of the tinsel chandelier. At $7 for 14 curtain rings with clips, you could use them as napkin rings, wine labels, etc. You may be wondering why I rolled up a sheet of paper to put inside the ring. I thought it would be a great conversation started to have each guest write down their word of the year and take it home with them. Have you ever chosen a word of the year? 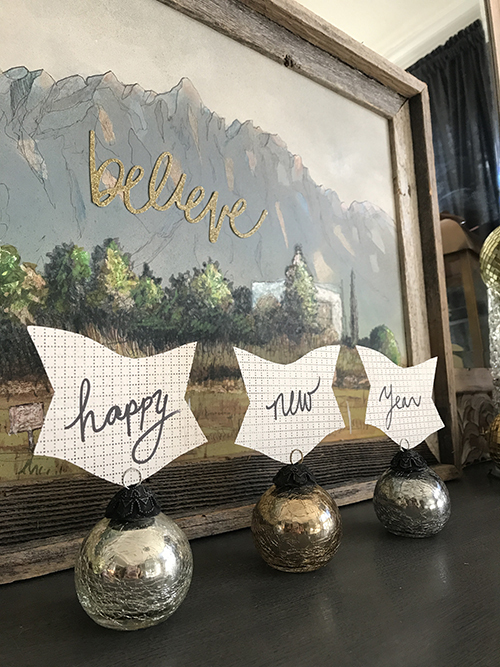 The basic premise is that instead of a doing a New Year's resolution, you choose a word that embodies what you want to focus on in the year ahead. Some of the words I've chosen in the past have included focus, gratitude, hope, present, etc. I've always really enjoyed the exercise of choosing my word and think it would be really fun to discuss it with my close friends over brunch. You could even choose a word to describe 2017 and talk about the highs and lows of the previous years before discussing your hopes and dreams for the year ahead. I would love to hear what my friends pick and the rationale behind it. I really think you can learn a lot about a person through a discussion like that, and I love getting to know my friends better. 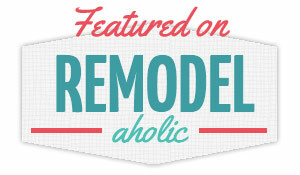 Over on the shelves, I used some of my favorite items from the Lowe's home decor section to really set the scene. 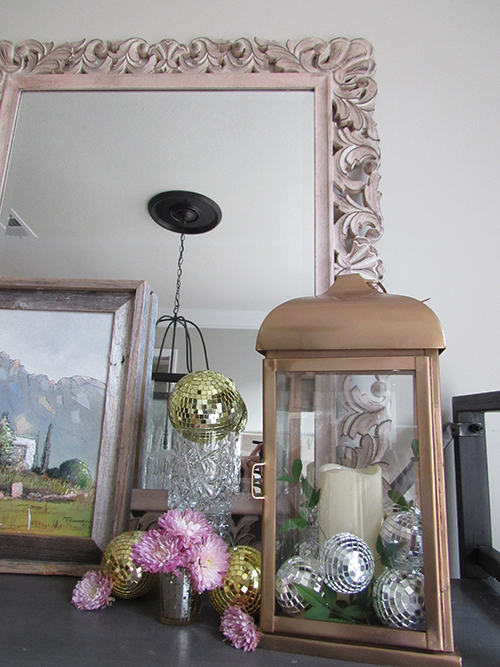 How pretty is that carved driftwood mirror? I fell in love with its rustic charm right away. I am a total sucker for that weathered driftwood finish. That rose gold lantern is a classic shape, and you could use it for so many things. 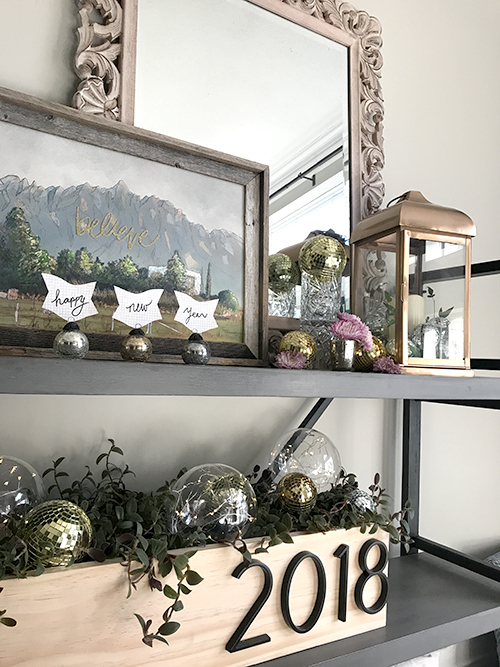 Since it was New Year's Day, I decided to surround the inner candle with my disco ball ornaments for a little extra sparkle, but then I tied it in with the florals of the centerpiece by adding some greenery from the yard. I asked my husband to build me this planter box, and he did not disappoint. He picked select pine (a little nicer and straighter than the normal pine) and used his table saw to cut 45 degree angles in each corner. 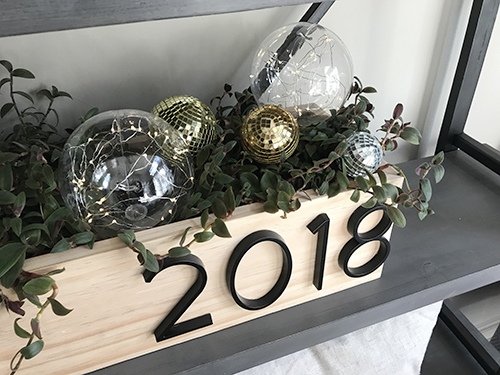 Some quick screws brought the box together, and then I hot-glued the street numbers to the wood to incorporate the brand new year. I filled the planter box with $5 clearance exotic angel plants and then styled it out with more disco ornaments and those LED orb lights from Lowe's that I love so much. The other accessories on the shelves are my own, including the hammered copper tray filled with bar supplies, the crystal whiskey glasses and the original landscape painting by my father in law. I even grabbed our metallic ornaments with the paper holders to spell out a message to the party guests. That's just some scrapbooking paper I had laying around that I cut into different shapes for each paper holder. It's a subtle message, but I love adding interesting details to my parties. 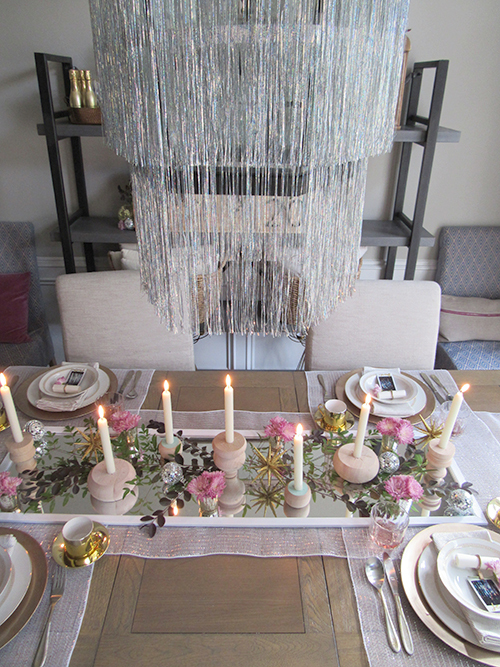 I love this New Year's Day brunch tablescape just as much as the dinner party. Which type of party is more your style? If you want to see the dining room in person and listen to me walk you through my favorite DIY aspects of this brunch decor, come watch my story on Instagram (@jordanG106). This post is sponsored by Lowe's. Thank you for supporting the brands that support this blog.